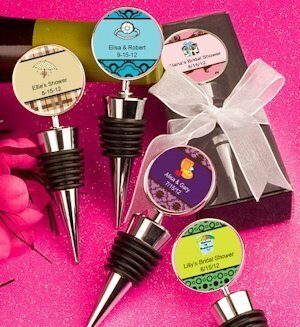 Your bridal shower guests will love the unique wine stopper design of these personalized shower favors. A useful and stylish gift, the assorted color combinations and themed designs along with 2 lines of custom text make this a favor your friends and family will appreciate. 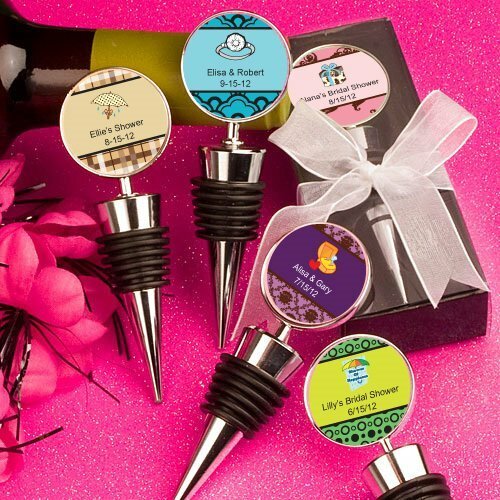 Each wine bottle stopper measures 3 3/4" x 1" and is made of silver metal. Each of our wine stopper bridal shower favors comes packaged in a clear topped box with a black base, finished with a white organza bow.